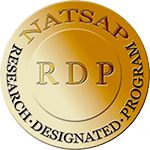 For the past couple years Oxbow Academy has been working towards being a more research based program, and we are proud to announce that we have been awarded by National Association of Therapeutic Schools and Programs and the Research Committee (NATSAP) to be a Research Designated Program (RDP). What does this exactly mean for Oxbow Academy? Oxbow is dedicated to collecting data using the Youth Outcome Questionnaire (YOQ) and the Parent Outcome Questionnaire (OQ) along with our own validated measurement tool to track a student’s progress in treatment called the Residential Emotional Social Behavioral Assessment (RESBA.) Since Oxbow has demonstrated commitment and dedication to using research tools and methods we have been recognized among only 38 other programs as being a Research Designated Program and hope that this helps others understand the impact and effectiveness of our program. We are also privileged to have Maria Watters on our team as a Research Director who is helping guide our program in this direction and helped design the in house tool of the RESBA with a college professor, Jared Schultz, from Utah State University. We are excited to share more on a webpage coming up in the near future. We are honored for the National Association of Therapeutic Schools and Programs (NATSAP) to award Oxbow Academy as a Research Designated Program (RDP). → What are the benefits of service learning?